There are many reasons why building a commercial property in Sylvan Lake makes good business sense. 50th street presents a rare commercial opportunity and if you’re indeed considering our town for your build, then this strip will be of great interest to you. Of particular interest, are the urban design guidelines that apply to commercial enterprises. 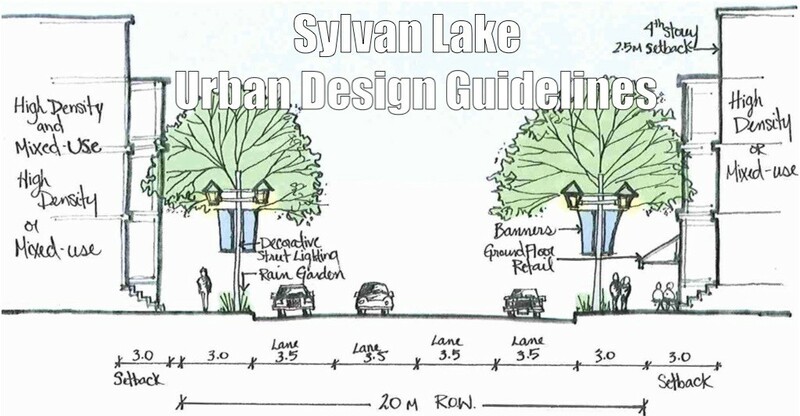 These are the guiding principles established by the Town of Sylvan Lake, items that protect the very persona that residents, visitors, and businesses find so endearing. Today we take a look at some of the key elements that will directly apply to your prospective construction project. Mixed-use sub-areas will dictate what can and can’t be allocated to commercial enterprises, while at the same time present opportunities. For instance, Sub-area A encourages that ground floor commercial development is focused on the corners to function as an extension of the downtown core. Sub-area B also encourages commercial development on the corners, but also at the mid-section of the block. Sub-areas G and J allow higher density of commercial development. The following map (courtesy of the Town of Sylvan Lake) details the existing commercial district and mixed-use sub-areas. i. Buildings should be completed to maximize sun exposure without adversely impacting neighboring properties. ii. Building height must meet the requirements dictated by each zone/sub-area. For mixed-use Sub-areas A, E, G and J a minimum building height (street) is 2 storeys (3.7 m high for the ground floor / 3 m for floors above the ground floor). iii. Mechanical equipment used in day to day commercial operations must be kept from outside public view. iv. Entrances must be universally accessible, minimize level changes, and be highly visible. The exterior design of your property must be consistent and consider the aesthetic and functional design of all 50th street businesses. i. Your property developer will work with the Sylvan Lake Development Authority to ensure compliance. This is where considering a builder experienced in design build methodology will be of great benefit. ii. Business signage should be uniform to the development design of the building. iii. Architecture should abide by the official 50th Street Area Structure Plan. iv. Finishing, additions, and enhancements to an existing building and all attached structures must complement the current design. v. Stucco cannot be used as the primary external wall material at the ground floor of your commercial build. vi. It is not permitted to use concrete block, plastic, plywood, dark-tinted and/or two-way glass, metal siding using exposed fixtures, or vinyl siding on the property exterior. vii. The view of the Lake, where applicable, must not be abnormally obstructed in any way. i. Natural Surveillance – Your commercial build must not create hidden/isolated spaces. A clear site line must be apparent on storefront sidewalks, entryways, and patios. ii. Territorial Reinforcement – Entrances and exits must be designed and landscaped to indicate appropriate use, with fencing and lighting dictating the “time of use” for each space while deterring vandalism during “off hours” of the day. iii. Lighting Optimization – Installations should provide a well-lit environment for pedestrians and lead them logically to and from the premises, day and night. Landscaping should be consistent with the current theme, with year round perennial species (where applicable) chosen to blossom colours throughout the year. ii. Business-front weather awnings for rain/snow shelter. These awnings should be of a traditional profile that are fixed or retractable. They should be made from premium quality canvas or woven acrylic (solid or stripped material recommended) and it is not acceptable to attach awnings that are less 3 feet (1 m) in coverage. Commercial projects should consider and incorporate sustainable measures into the construction process, building materials, and ongoing operations. This includes but is not exclusive to solar power, recycling, utility management, and green-building materials. Sustainable building practices will also reflect well upon resident (customer) perception of your business. Use a general contractor versed in eco-friendly building. There is of course much more to know about building or undertaking a major commercial renovation along bustling 50th street, but the above is a great start. For the rest, contact Apple Building Systems – your ultimate guide to construction in Sylvan Lake Alberta.